Does High Population Density Make A City More Liberal? You are at:Home»Special Projects»Does High Population Density Make A City More Liberal? The idea of population centers being strong holds for Democrats in the United States has become almost a meme in the political sphere. Democrats control urban centers, while Republicans gather what support they can in the areas in between. The question I have had for awhile now is if this is something that simply occurs due to certain characteristics of urban and rural life, or does this occur because city centers could not exist without liberal tendencies. Both side of the political spectrum claim to be protecting the rights of individuals. The left, claims that this can be done with governmental protections and laws. The right fights to protect the rights of individuals by arguing for limits on governmental powers. When this comes to urbanization and cities, the ideas of the left on protecting individual rights lend them self to successful city management. Examples such as noise controls and pollution show that their is a need for laws in urban areas that aren’t necessarily required in more rural areas. This logic leads me to believe that areas with large population densities not only tend to be more liberal, but it is required to maintain cohesive relationships between citizens. While proving such a hypothesis will take a lot of research, the visualization below attempts to determine if there is at least a statistically significant relationship between population density and political preferences. The data for this study comes from two sources. The first data set comes from a MIT study about whether city officials were reactive to public opinion.This article created a methodology for grading cities on how liberal or conservative their citizens’ policy preferences are. We will use the numerical measure as the dependent variable of the regression analysis. The second source of data is the United State’s Census Bureau. I acquired, both the population data and city’s dry land square mileage from American Fact Finder. I then used these variables to calculate population density, the independent variable for my regression analysis. 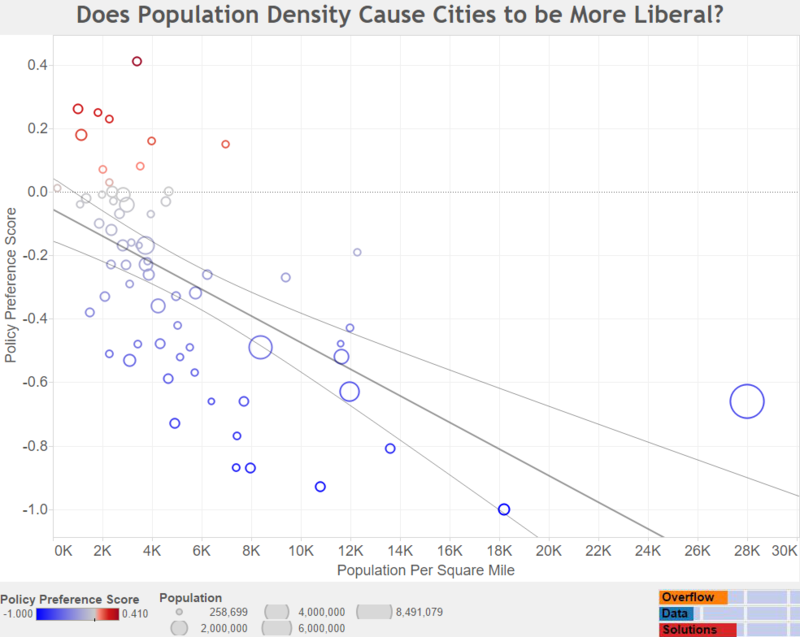 As the visualization shows, there is a fairly strong relationship between the population density of a city and how liberal or conservative it is. It obviously is not a perfect fit. New York, out to the far right, should be the most liberal according to our logic, but is not the most liberal city in the nation. This may be because of the different types of people that live in New York, such as Wall Street traders and corporate executives, that may provide somewhat more conservative view points. Instead of New York, being the most liberal city, that title belongs to the second most densely populated city in the US, San Francisco. This likely shows that their are other variables that are related to how liberal a city is. Overall, while it obviously is not a perfect model, their definitely is a statistically significant relationship between population density and a cities policy preferences. Further research may help to show more about how this relationship works and if their is some sort of causation. It may also help to show what other variables are related to policy preference.